I’ve just had a baby! 7 months on and I don’t think I can keep using that excuse! I am the first to admit that I am carrying an awful lot of excess weight and the whole just had a baby line is not really cutting it. So today I have made a conscious decision to start losing ‘the baby weight’. There is one problem though… I don’t know where to begin. I know the basics – I need to eat less and exercise more. That’s fine in theory. However in practice not as easy. I always have a fairly healthy tea (because Mr K cooks it!) but breakfast and lunch are often a bit hit and miss. It often depends on how frazzled I am that day and if baby boy decides that it is ok for me to take time out to eat. Therefore quite often I snack! Not always healthily I might add! I need to start stocking up the cupboards with healthy snacks but do you know how much they cost these days! Fresh fruit and veg is extortionate! Now, about the exercise. When baby boy was about 10 weeks old I joined a local pram fit group. I went to a few sessions but felt a little bit alienated to be honest. Everyone in the group seemed to already know each other and I felt like I didn’t quite fit in. I stopped going which I do regret and I have never managed to pluck up the courage to rejoin. As a positive step I have started swimming once a week with a friend. We go to a ladies only session and it is nice and quiet. I enjoy this but I know that I need to do more. Increasing my daily activity such as going for a walk with baby boy either in the sling or pushchair is a goal that I have set myself. We live near a big park so really I have no excuse to not go for a walk. I also plan to eat 3 meals a day and cut out my unhealthy snacks. I will start with these and see how I get on. I am very impatient and want to see results quickly but this is going to take time and I have to just stick at it. 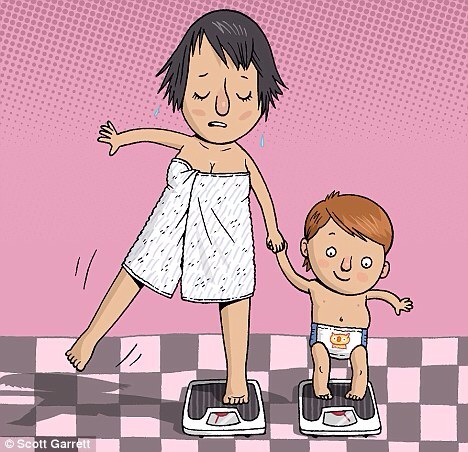 Do you have any tips for losing the baby weight? My willpower is awful too. My nan offered me a piece of cake yesterday and I happily accepted it without a second thought! Oh dear, this is going to take longer than I thought!! Step one needs to be get the nasty foods out of the house. If there is only nutritious ones to snack on problem is solved. Speed is just a matter of intensity, more exercise, more results. Less junk food, better results. Thanks for the advice. I have no more unhealthy snacks in the cupboards so step 1 is complete. Next step is the exercise. Great post! Came across this while researching tactics for new parents to stay fit with the busy lifestyle of having a newborn. Currently I’m helping a team add exercises to a fitness app that you can actually do WITH your infant child. That way you can get some exercise in while intimately bonding with your new child!